My dear friend Teresa sent me this card last week. First of all, I was delighted to receive a card in the post. Secondly, I love the sentiment. She couldn't have chosen a better card. Some of the best times were in that period between college and kids, times spent with Teresa and the rest of my UMD besties. We were "provisional adults," making our way and finding our place in the world. I'm so grateful that when we all landed, we were all still together. Finally, the photo. God, I love that picture. 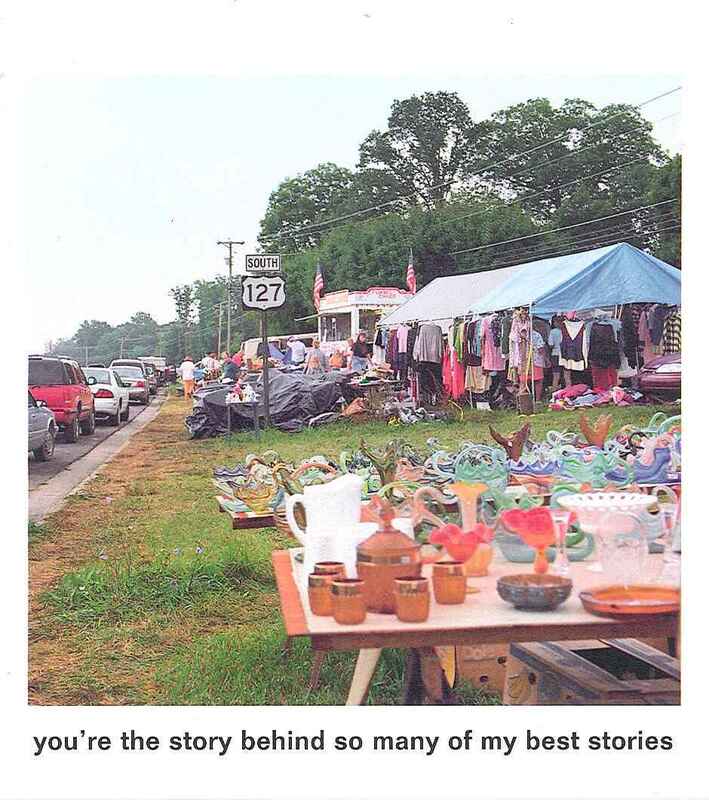 Look at the history on those tables, hanging in that tent. That's one of the things I love the most about wandering around antique stores and flea markets -- the history, the possibility, the story behind the diamond-cut compote with lid or the boy scout field guide from 1936. Sometimes a story will emerge from the treasures we find along the way. Last night, a story emerged from the piano in my basement. 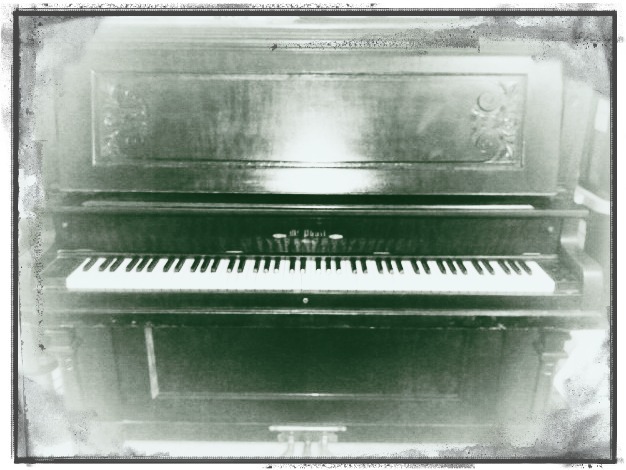 We obtained this piano in February of 2011 from a friend of a friend who was moving to the East Coast. She gave us the piano; we just had to find someone to get it out of her house. We hired a piano moving company and met them at her house on chilly Saturday morning. She'd also gotten the piano for free about a year before but had never played it. Its previous owners were an older couple who'd lived on a farm for decades. And that's where its history ends. It's a beautiful piano, a McPhail, with lovely, intricate design work. The movers cleaned it in her driveway and removed chicken feathers, old pencils, a playing card, and other various treasures. It's an old piano, the keys are a mess of tape and permanent marker, some of them stick. My husband has played out some of the issues, but we haven't had it repaired or tuned yet. 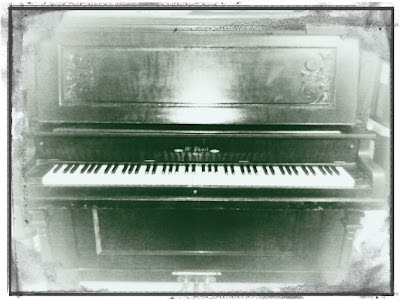 Since we brought the piano home, an idea for a story has been shaking around in my head. I wanted to know the history of this piano, all its homes, all its players. I didn't have much to go on, but imagining and designing history is one of the best parts of my job as a writer. I had the characters: a girl with an old-fashioned name and a love of antique stores, a single dad who worked as a piano mover and repair specialist, a dad who could fix just about anything except a marriage that didn't end well or his daughter's sense of isolation. I knew there would be some sort of time-travel element and a boy, of course. And that's as far as I got. For one thing, I'm up to my eyeballs in WiP, and for another, what do I know about writing paranormal? But yesterday Toad started piano lessons with our wonderful neighbor Mel and everything changed. After dinner we went into the basement so Toad could show us what he'd learned. I recorded a video with my phone and got so much more than an out-of-tune rendition of Hot Cross Buns. Think Ghost Adventures. Think light orbs. Think spiritual energy. Our house was custom-built ten years ago. No one has lived here but us, but there have been a couple of instances over the years -- both involving Toad -- that border on the unusual. I've watched last night's video dozens of times and I have to say, I'm intrigued. I'm curious. I'm inspired. Yes, a story emerged from that piano and I've captured it on video. Stay tuned. There's more to tell. **Update: What's on the video? Six distinct traveling light orbs. My husband's comment: "That's DUST. DUST. If dust is paranormal, then our house is the paranormal epicenter of the nation." And this: "My fortune cookie today read, Protect your reputation. Don't let people who read your blog think you're crazy." What inspired your current WiP? Got any tips for writing paranormal? Intriguing indeed. What was on that video? Tell us! Paranormal is awesome! My favorite genre. Go with it. Very spooky, and very inspiring! I can't wait to see where you run with this idea of a haunted piano... whooooooo. Yes! I want to see the video too. It's October, I'm in the mood for spooky stuff. LOL! I saw a really great episode of "Celebrity Ghost Stories" (Don't judge me) where actor Tom Arnold recounted a story of a haunted piano in the house he grew up in, I believe on an Iowa farm. It was creepy!